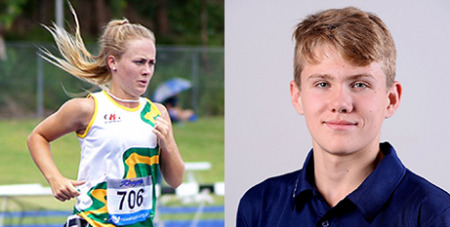 Paralympian swimmer Tim Hodge and world cross-country champion Ella Heeney have received the Vince Villa Award for most outstanding NSW Catholic school athletes in 2018. Source: Catholic Schools NSW. Hodge and Heeney join past winners of the prestigious NSW Combined Catholic Colleges (CCC) honour, including Olympian Jana Pittman and NRL stars Nathan Cleary and Campbell Graham. CCC Chairman John Sparks said the awards are the pinnacle of the annual NSW Blue Awards, established in 1997 to recognise the outstanding achievements of NSW Catholic school athletes across all sports. “Catholic schools have nurtured the careers of hundreds of professional Australian athletes, thanks largely to the dedication of volunteer teachers and well supported by parents,” Mr Sparks said. Hodge, of Patrician Brothers’ Blacktown, was recognised for his strong showings at the 2018 Gold Coast Commonwealth Games and the Para Pan Pacific Games in Cairns. He won silver medals in the 100m breaststroke and 100m backstroke at the Commonwealth Games before picking up four gold medals and a silver at the Para Pan Pacific Games. In 2016, he competed in five events at the Rio Paralympic Games, placing fifth in the 200m individual medley and sixth in the men’s 100m backstroke – outstanding achievements for a schoolboy athlete. Mr Sparks said Hodge was born with a lower leg deficiency and had his right foot amputated when he was four. He is also missing two fingers on his right hand and his right arm is shorter than his left. “But none of these conditions stopped him from developing into an outstanding swimmer and backstroke specialist. Tim would regularly compete against able bodied athletes, just to get involved. Heeney, from Mackillop College in Port Macquarie, won the World Schools Under 18s Female Cross Country Championship in France last year. She also finished first in the NSW CCC, New South Wales All Schools and School Sport Australia events in 2018. “Ella has been a member of the NSW Combined Catholic Colleges’ Triathlon Team in 2013, 2014 and 2015 and in 2017/2018 represented Australia at the World Cross Country event,” Mr Sparks said.